This beautiful hand-made Amelie flapover navy leather messenger bag with 3 external zips and one internal zip is a classic leather bag made of beautiful handpicked uniquely produced leather. There is a pocket on top, a slanted front pocket and a back zipped pocket, using YKK zips externally and nylon internally. We made this bag as it’s just so simple, is expandable, comfortable and easy to wear with a fully adjustable strap and brass fittings. 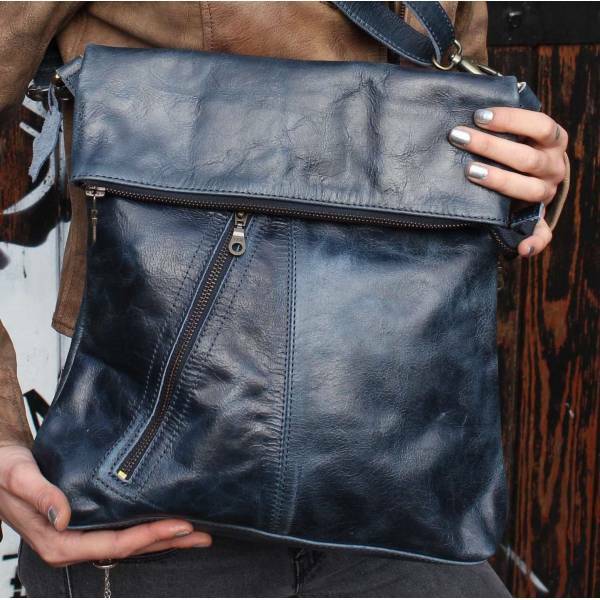 It has a front pocket under flap (the bag is reversible) and can be worn across the body or as a shoulder bag. We use waterproof lining so everything stays dry inside. Top of bag: 28cms wide, bottom width is 32cs, height flap down is 32cms, flap up is 42.5cms, base of the bag is 8x28cms, straps measures 78 to 140cms, slanted pocket is 20cms and goes into 17-20cms depth, the back pocket is 25x27cms, the internal zip pocket is 18x16cms and the weight is 570grams. the internal zip pocket is 18x16cms or 7x6inches and the weight is 570grams.